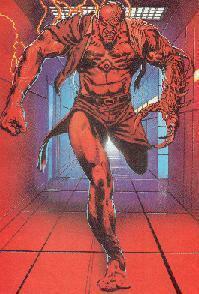 Powers/Abilities: The Bacillicons are energy analogues of their original human forms. As such they can absorb external power sources to increase their power levels, allowing the creation of body armour, regeneration and providing enhanced human strength, reflexes and cognitive powers. Through a process known as "Digitating" they can reform their bodies, or parts of their bodies into weaponry or vehicular form. These forms can be extremely complex energy analogues of advanced technology such as energy weapons with enhanced eyesight and tactical imaging, motorcycles, skymobiles and helicopters, or simpler forms such as bladed weaponry. When drastically weakened they could even merge their bodies with that of another human being, as Purge did with Greville. They could also digitate their molecules and transport themselves along phone lines. They had limited abilities to communicate with cybernetics. Their weakness was the C.P.U. (Central Processing Unit) which was an analogue of a human heart. As former mercenaries they were skilled in the use of various weapons, but compared to Digitek's scientific background this was almost a limitation: while they effectively had the same powers as Digitek, he adapted to them more quickly and was able to use them in more inventive ways. 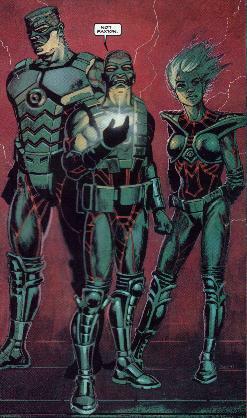 HISTORY: (Digitek#1) - Paxton was in charge of a squad of mercenaries sent by Miracle Systems to steal Psi-Key. 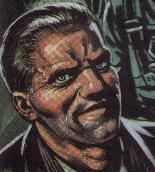 When Greville attempted to control Psi-Key with a computer virus, the protosilicon mutated the virus. Paxton ordered Vogel, Petrezyn and Delgado to his side as the virus went wild. The virus attempted to possess the mercenaries and, while Delgado and several others were killed in the process, it succeeded in creating the Bacillicons: Byte, Kay and Purge. (Digitek#2) - The Bacillicons had Greville create a machine to track Digitek. Unbeknownst to them Digitek was already between them and Psi-Key. As soon as the machine was activated and they realised he was there, Byte and Kay attacked. Digitek fled into the computer system, but Byte and Kay followed. They reappeared in Samantha's van, by the remains of the Nakasoni Corporation research labs. During the ensuing battle, Kay managed to strike at Digitek's C.P.U., but Samantha Bryant attacked her with electrical cables from the wreckage. Digitek then made short work of Byte and escaped. Purge arrived with Greville only to find Byte and Kay coming round. Greville gave them Samantha's home phone number so Byte and Kay could digitate there, destroying the apartment in the process. (Digitek#3) - The Bacillicons tracked Digitek to the Cotswold Hills, Gloucestershire. 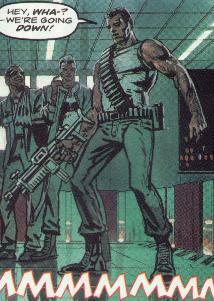 Deathlok held them off so Digitek could escape, but was digitated back to New York. The Bacillicons almost caught up with Digitek, but the chase led them into the communications network. Digitek reached safety at the home of Marx Jephcott, a friend of Samantha's. Digitek disconnected the phone line as Byte was coming through, and the Bacillicon discorporated. (Digitek#4) - Digitek revealed his location to the Bacillicons. They showed up at Jephcott's computer shop, firing at thin air, trying to draw Digitek out, but he absorbed the energy and used it to his advantage. Digitek destroyed Kay, and almost beat Purge, but before he could finish the Bacillicon off, it escaped through the phone line. Digitek followed Purge to Miracle Systems, but by the time he got there the Bacillicon had fused itself with Greville, and Psi-Key was going wild. The freshly powered up Bacillicon appeared to have the advantage over the weakened Digitek, and hurled him at the Geoid. Psi-Key joined with Digitek. Now regenerated, Digitek easily destroyed the remaining Bacillicon. Byte: "Shouldn't of done that." Digitek (while thrashing Byte): "THAT'S SHOULDN'T HAVE MORON!" Purge, who had been the leader of the mercenaries and therefore the cleverest, had a bit more dialogue than that. Even then it was mainly macho posturing. Vogel to the left here is to be played by Arnie in the upcoming Digitek film by Marvel Studios UK., said to come out shortly after the series of Death's Head films planned for release in... What's that? You don't believe me? Well I can dream can't I! The full names of all members were revealed in All-New OHotMU Update#1. Greville worked for Miracle Systems as head of their Project Development Division, and was responsible for the theft of Psi-Key. He designed the computer virus that was meant to control Psi-Key. When that virus mutated and began killing the mercenaries, turning Paxton, Petrezyn and Vogel into Bacillicons, he left the room and watched from a monitor. He soon allied himself with the Bacillicons, thinking he could manipulate them and still gain control of the protosilicon, but was inevitably absorbed into Purge and became a Bacillicon himself. He seemed obsessed with the both of the Bryants, though he particularly hated Jonathan as a business rival. He was an electronics genius. I'm assuming his limitation is clumsiness, there's no other reason given to explain the sling he has around his left arm from his very first appearance to his merge with Purge! A rival company to Nakasoni, Miracle Systems had offices in Central London and Middlesborough. They had an operative working at Nakasoni who coded out the specifications of the Project Digitek mainframe enabling them to build one at the underground laboratory in London for the stolen geoid to be placed in.